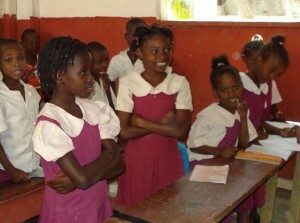 School children at House of Hope, Goyavier, Haiti. Genevieve Drouin, Canadian Feed The Children’s Regional Program Manager – Americas, and Heather Johnston, our Director of Programs, are spending two weeks visiting our partners for monitoring and evaluation purposes. 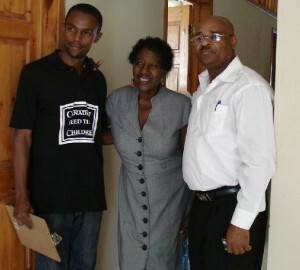 It’s really exciting because they are also kicking off CFTC’s Theory of Change in Haiti. Their first step is to bring our existing local partners, some potential new ones, other NGO and governmental stakeholders, and our Haitian team together in a workshop in our humble offices in Port-au-Prince to map out the goals and plans to achieve the change we’re all working toward in Haiti over the next three years. We’ll share more about that in the coming days. As CFTC becomes increasingly focused through our Theory of Change on food security and education, Haiti is ripe for significant advancements in terms of our programming there. We have already had some great success implementing agricultural improvements through a CIDA-funded project just outside Léogâne which we brought you in last month’s feature story, Good Development in a Disaster Zone. This work is typical of the foundational and developmental approach that has the greatest potential for long-term impact on children’s lives. Leveraging the resources of the Haitian people themselves, it brings children and their parents the opportunity not just to recover from the natural disasters that Haiti has experienced – and is susceptible to – but builds resilience and adaptive capacity for a self-sustaining future: one that includes the ability to grow, purchase and consume better nutrition through agricultural development and livelihoods, and continues the focus on ensuring more children have access to the education they need to break the cycle of poverty in Haiti. Genevieve’s story about one young boy she met at House of Hope Orphanage is an apt demonstration that the resources and resilience of Haitian youth holds the key to long-term sustainable growth and a better life for all in Haiti. Stay tuned as we bring you updates throughout this week and next. 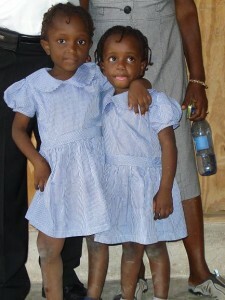 These two sisters reside at House of Hope where they receive shelter, education, nutrition and care. Port au Prince, Haiti, March 11, 2013—In my conversations with Haitians over the past several days I have heard frequent references to life before and after the quake. It’s as if that event has divided people’s lives into before January 12, 2010 and after. Driving through Port-au-Prince, we see the collapsed buildings and tent cities that remain, but we also see people rebuilding around every corner, evidence of an incredible resilience in people who have faced such devastation. We are in Haiti on a monitoring trip, which involves meeting with each partner and visiting their project sites to assess their progress and provide support to their future work. We are also here to begin Canadian Feed The Children’s Theory of Change process during which we will work with partners to clearly define the long-term objectives that will guide our work in Haiti in the coming years. L to R: House of Hope Project Manager, Louis; founder Alice Barthole; and CFTC Country Representative for Haiti, Madsen Gachette in the new girls’ dorm at House of Hope. Our first partner visit was with House of Hope orphanage, a CFTC partner that provides shelter, education and nutrition to around 200 children. We spoke with several children who were willing to share their stories with us, but there was one boy who stood out to me. Sixteen-year-old Richard Jean Jacques was brought to the orphanage at the age of six. He has no recollection of his parents. What he does have is a love for singing. We were given an impromptu concert, including one of his own compositions. While his voice was captivating, what really shone in him was the confidence he carries for his talent and his future. He spoke about working to develop his career as a singer and about the impressive number of performances he has under his belt already. But that’s not all, he also wants to go to university to become an engineer. He told his story with such conviction that he left us with no doubt that he is well on his way to achieving his dreams. A young boy, whose early life started with the loss of his parents, has shown the resilient spirit that has come through among many of the Haitians we have met so far. He is working hard to achieve his goals, and certainly managed to convince me that he will come out successful on the other side. Stay tuned as later this week CFTC’s Director of Programs, Heather Johnston, will be back with more from Haiti!